Welcome to the From The Heart Stamps September Blog Hop. If you came from Cammy's Blog ,you're in the right place. randomly selected image to use. Mine was Hold Tight Hugs. and some turquoise Baby Beads from Queen & Co. 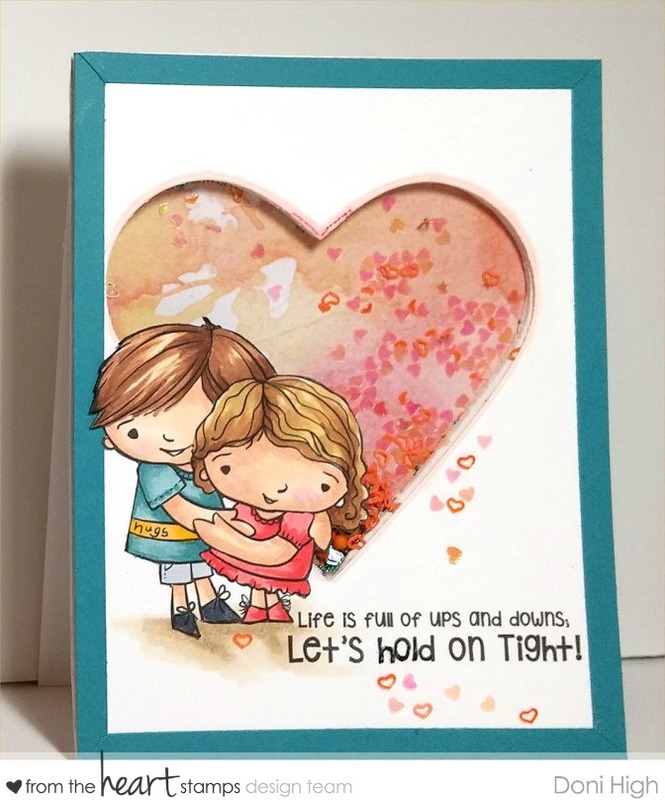 I love the sentiment : life is full of ups and downs, Let's hold on tight! So that's what we are all going to do right now...hold on tight ! We will be taking a break while Faith recovers. and see what she has created. Doni, this card is totally adorable! Sweet sweet sweet and I LOVE shaker cards!!! Oh my...I love, love, love your card. It's my wedding anniversary in October and this image might just fall into my cart before then so I can create something similar with it. I love the shaker box behind it too. Thanks for sharing and inspiring me. What a sweet image and fun shaker card Doni! This is so pretty, Doni! I love shaker cards, and using a heart shape for the shaker element goes perfectly with this digi and sentiment! Beautiful coloring, too! 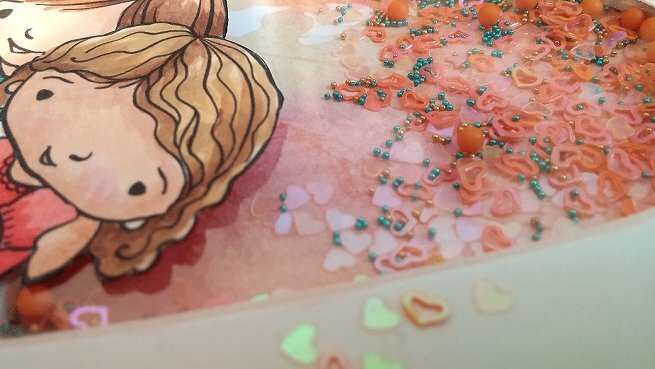 Beautiful coloring and your choice of filler for the shaker card is so pretty. This is precious, Doni. Adorable shaker card and coloring of the image. Doni, this is perfect! I love that heart with these tow and the shaker idea is pure brilliance! I'm going to follow your blog so I can keep up with all the beautiful things you make. Hugs! Love your shaker card with the Hold on Tight image. super adorable colors and layout. Thanks for the inspiration. What a magnificent card. Nice job! This is adorable! I love what you did with this image. It is fun and inspirational all at once. Great card! I love the color combo you went with on this. Love the heart made into a shaker. Cute!! FYI your link to next blog did not work for me. I went back to main blog and found it. just wanted you to know. This is so lovely, Doni. Your coloring and that you´ve made a Shaker Card. Just great ! Beautiful shaker Doni, as always wonderful colouring and design. Fantastic card! I love the sentiment! Doni - you are such an awesome colorist and card designer - I am always so drawn to your work and it's been a pleasure working with you. Wow, beautiful. Love the heart filled shaker with this image and sentiment. I love this card and the sentiment is great. I like the shaker heart - must try this sometime. Absolutely gorgeous Doni! I love your shaker mix! Super cute card and a fantastic design too! I love shaker cards Doni! Never make them but I do love them and yours is awesome! Sorry for the delay in getting around to hop-back to school has been crazy trying to get back into a routine!